Twitter has been in the news a lot lately for its rumoured changes and the changes they have bought forth lately. 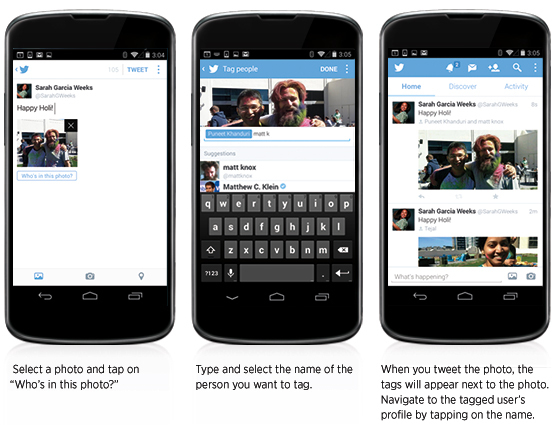 Recently, Twitter announced about its newest two features – Where it would start letting users share up to four photos within a single tweet, as well as tag up to 10 other users in a photo. Tag up to 10 people in a photo: you can tag up to 10 people in a photo and still have all 140 characters at your disposal, it’s like the Facebook way where you can add a picture to your profile and tag your friends/ followers. Share upto 4 photos in a single Tweet: you can also share series (upto 4) of photos that automatically create a collage. The ability to upload multiple photos has rolled out on iPhone, and is coming soon to Android and through using of desktop. With these two features it is the continuation of Twitter efforts to give tweets more visual impact, In October 2013 where it had introduced media-forward timelines, where it caused pictures to automatically be displayed on user’s timeline without having to click on the link. How Bussinesses can leverage these new features? GE has gathered photos of heavy machinery and have told their followers a very visual story about the difference engineers make. As they say a picture is worth a thousand words, with this collage it does the perfect art of storytelling with its simplicity. This cat-food brand, has made use of this picture collage to ask their followers questions. Normally you can simply ask them to choose from a, b, or c. But with this photo collage, it makes the followers inquisitive looking at the picture and thus making them click on the link. Isn’t it a great way to collect user opinions and feedback? I really think it is. As this feature has just been rolled out on mobile apps, not a lot of brands have experimented with this feature, thus I took the liberty to re-create sample ideas for some brands here. 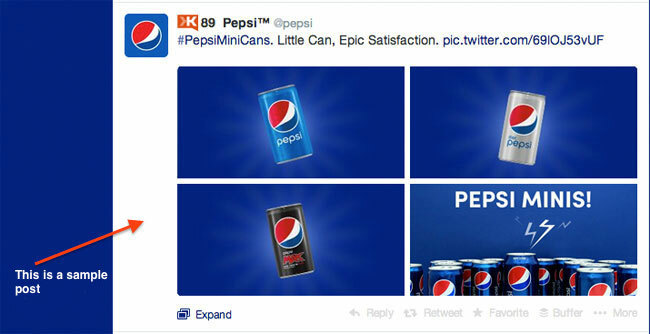 I like Pepsi as a brand much, so thought how about they showcasing their brand new Pepsi Minis in a complete collage. All three products and with some great visuals. This gives businesses a way to showcase their key unique selling points, highlight products, briefing benefits, product lines and so on. 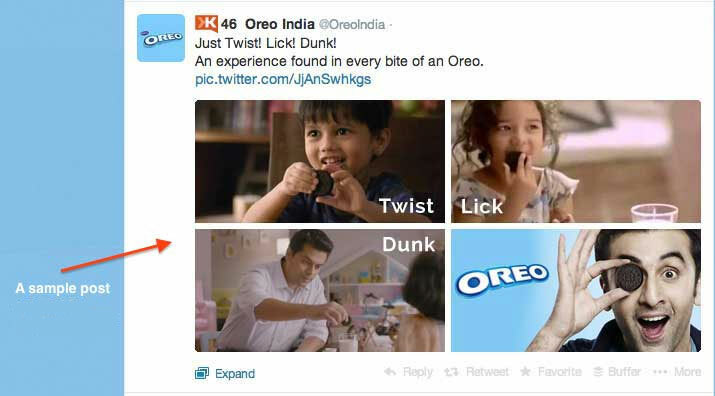 Another example that I created is for Oreo, my super brand! Can’t wait to see how they leverage this feature. The example is based on their communication “Twist. Lick. Dunk” and then finally devouring it. I am sure this restricts the demo to be of 3-4 steps only, but that is the beauty! You need to make it simple for your audience. Consider this – Simple 3 steps to make awesome coffee, 4 Steps and you can win a chance to watch FIFA 2014 live!, 4 ways to boost your Twitter engagement with RebelMouse and so on. UK non-profit organization Medecins Sans Frontieres (MSF) used this feature to highlight its work in combating the Ebola virus outbreak in Africa. A great way to share what you are upto with your followers to make them feel connected and attached. I am also expecting some new Twitter tools for to enhance these features! Will look forward to them to add in this list of Twitter tools to business. 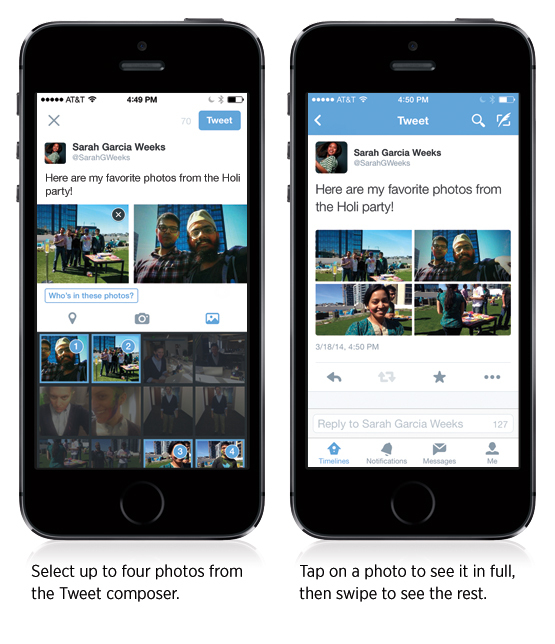 Have you started using Twitter’s new photo sharing capabilities? Are you using them for some other purposes? How about tagging? Would be great to hear from you. A social media and web tech enthusiast. I keep myself busy with building social media strategies, tactics, exploring new platforms and sharing the best of my knowledge online. I like to play basketball and football. Hi Harsh. Nicely explained. Can we connect to discuss some ideas?